The cold in general, or freeze therapy for athletes more specifically, when used in the right way, can be a highly useful tool for sports injuries recovery as it helps to reduce swelling and inflammation, clear lactate and relieve temporary aches and chronic pains. It can lessen or eventually eliminate delayed onset muscle soreness (DOMS), speed up injury recovery times or provide maintenance immune system boost in order to get you back to training significantly quicker than usual. In contrast to the basic home remedy of an ice-pack that targets only localized areas of concern, a full body freeze therapy for athletes today focuses on two main types: ice bath and Whole Body Cryotherapy. Let’s compare the two. An ice bath freeze therapy for athletes works by constricting blood vessels and lowering metabolic activity, which, as a result, breaks down swelling and stops tissue breakdown. It helps to flush out metabolites build up in your muscles during sports training or exercise. An ice bath, however, doesn’t suppress inflammation, which limits access to the source of your injury-based pain, so it essentially acts as a better solution for minor injuries that don’t produce much inflammation. 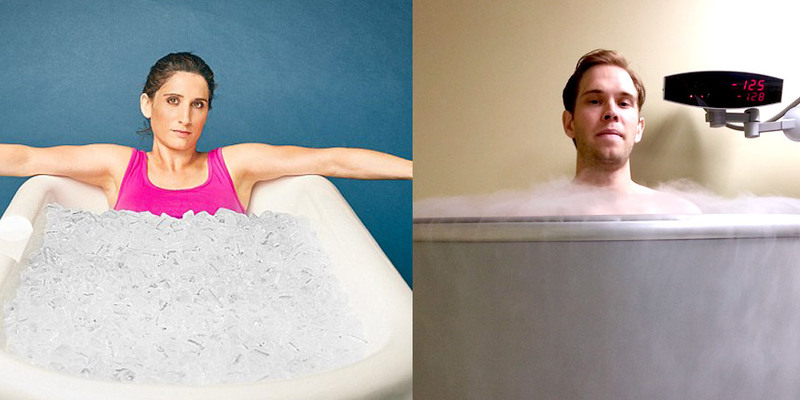 Why Should You Use an Ice Bath as Freeze Therapy for Athletes? Most people have likely used an ice pack before in order to help heal a previous small localized injury or bring down the swelling. Cold water immersion, by contrast, is often part of a weekly routine freeze therapy for athletes, by contrast, generally produces a more comprehensive and longer lasting change in deep tissues. It is also a more efficient and faster method of cooling larger surface areas and several muscle groups at once. Initially, the ice bath freeze therapy for athletes can be a pretty daunting experience. Hence, it is recommended to build it up gradually. Start with one or two minutes the first time you try it and gradually increase up to about 6 minutes. Once your system feels acclimatized to this duration and water/ice temperature, continue extending the duration to between 8 – 15 minutes. Some athletes build it up to 20 minutes but anywhere around 15 usually produces a plausible effect. Whole Body Cryotherapy is a popular and newer, more effective multi-dimensional freeze therapy for athletes (and other health enthusiasts). Its process works by lowering the body’s temperature to about 10 degrees Celcius to stimulate the release of endorphins and fight inflammation. It helps with a variety of conditions, from sports injuries to chronic pain from arthritis and even seasonal allergies, as well as rejuvenating and overall revitalizing the body by strengthening the immune system at a deeper level than a standard ice bath. Why Should You Use Cryotherapy as Freeze Therapy for Athletes? Cryotherapy Toronto’s Cryotherapy takes away all the discomfort and negative aspects of an ice bath. Say ‘goodbye’ to the length of time and the initial uncomfortable dip in an ice bath. Instead of getting wet in an ice bath, you will be wearing special booties, gloves, and underwear. A quick 2-3-minute session in our cryosauna gives you even more benefits than an ice bath. Inflammation gets reduced, energy increases, and muscles get invigorated and refreshed, and pain starts getting more manageable soon after starting treatments. Even sleep improves… Today, Whole Body Cryotherapy is becoming increasingly popular as an alternative freeze therapy for athletes with acute injury pains and chronic illnesses. Pro athletes like Floyd Mayweather Jr, Lebron James, Kobe Bryant among many others swear by the benefits of Cryotherapy and use it regularly to alleviate not only sports injury-related symptoms but also delayed onset muscle soreness after workouts. How Long and Often Should You Do Cryotherapy? Each Whole Body Cryotherapy session in our cryosauna lasts between 2 and 3 minutes (depending on your condition and cold tolerance level). The frequency of treatment sessions essentially depends on your health goals. Professional athletes and those with injury-related concerns may want to come in up to 4-5 times per week, while others do 1-2 weekly maintenance sessions. Consistency is key. To learn more about how often should you do cryotherapy, check out our list of session frequency based on your health goals. Contact us to request your free initial assessment appointment or to discuss your health goals and our available cryotherapy packages that you can also review here. Optimise and speed up your sports injury or muscle soreness recovery so you can resume training and compeitions with confidence!